This Sentiment Staples: Thanksgiving stamp set is the eighth in a series of basic essentials for both new stampers and more experienced crafters alike. The font options of the three medium-sized greetings offer flexibility to accommodate a variety of styles while the selection of companion sentiments gives you the freedom to personalize your greetings. This set focuses on Thanksgiving and notes of gratitude. Pair these sentiments with images in your collection to freshen up well-worn stamps and give your favorites new life. STAMP DETAILS: This stamp set comes on one 3 x 4 acetate sheet. 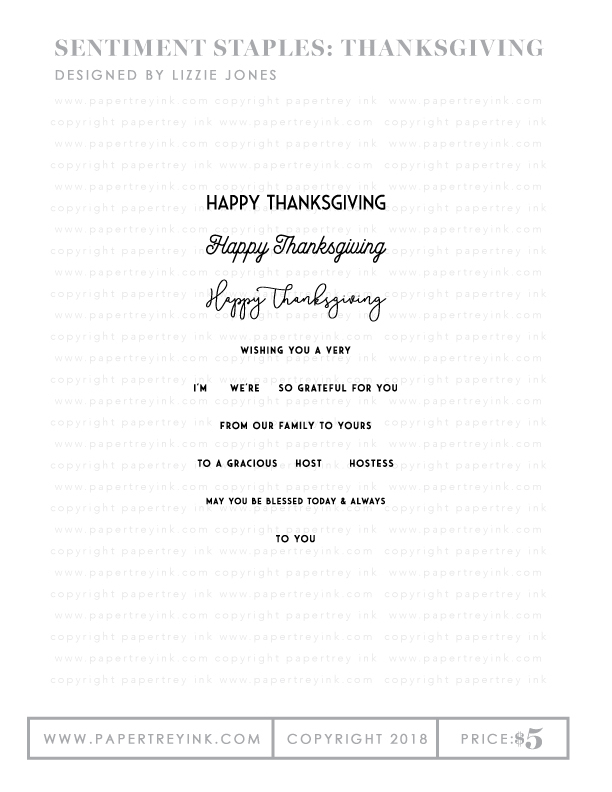 The block “Happy Thanksgiving” sentiment measures 2 ½” wide by ⅕” tall. The more formal script sentiment measures 2 ½” wide by just over ⅜” tall. The casual script sentiment measures 2 ½” wide by just over ½” tall. The “from our family to yours” sentiment measures just over 2” wide by 1/10” tall. The “so grateful for you” sentiment measures just under 1 ⅔” wide by 1/10” tall. The “to you” sentiment measures just over ½” wide by 1/10” tall. Use this stamp set and/or coordinating die to create pretty cards with a leaf and floral frame motif. Die cut the frame design or stamp it, then stamp a message in the frame’s center opening. This set features an autumn theme with sentiments relating to Thanksgiving, Fall, and celebrating blessings. The frame opening is large enough to encompass many of Papertrey Ink’s beloved sentiments. STAMP DETAILS: This set comes on a single 4×6 acetate sheet. 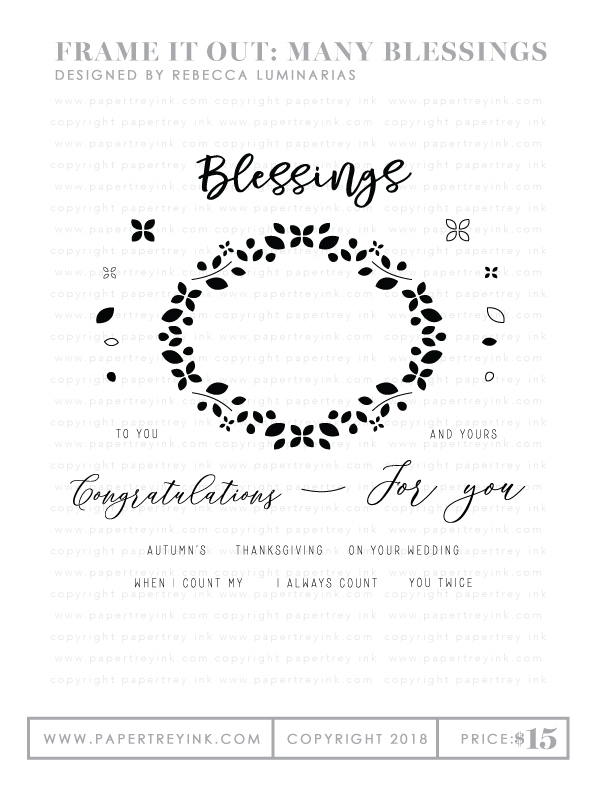 The frame measures roughly 4” W x 3 1/8” H. ‘Blessings’ measures 3” W x ¾” H. ‘You’ is approximately 1 1/8” W x ½” H. ‘Thanksgiving’ is about 1 ¼” W x 1/8” H.
This die cuts out the small leaf, stem, and floral motifs and leaves a large intricate frame in their place, with the center piece intact. Create an easy, but beautiful one-layer card front by die cutting the frame and adding a favorite sentiment in the middle. Everyone loves to be appreciated and the Say It Simply: Giving Thanks for You die is just perfect for letting someone special know just how grateful you are for them. Each of the Say It Simply dies contains a larger scale phrase perfect for adding a sentiment on a card front, or even on the inside of a card for that matter! Use as a single die cut, stack up several for a thicker look or even emboss the sentiment onto the front of your project! Die cut them from watercolor card stock and add your own color, use ink blending techniques and more! There are all sorts of design options at your fingertips with these versatile – and beautiful – dies! Simply Gourd-eous! 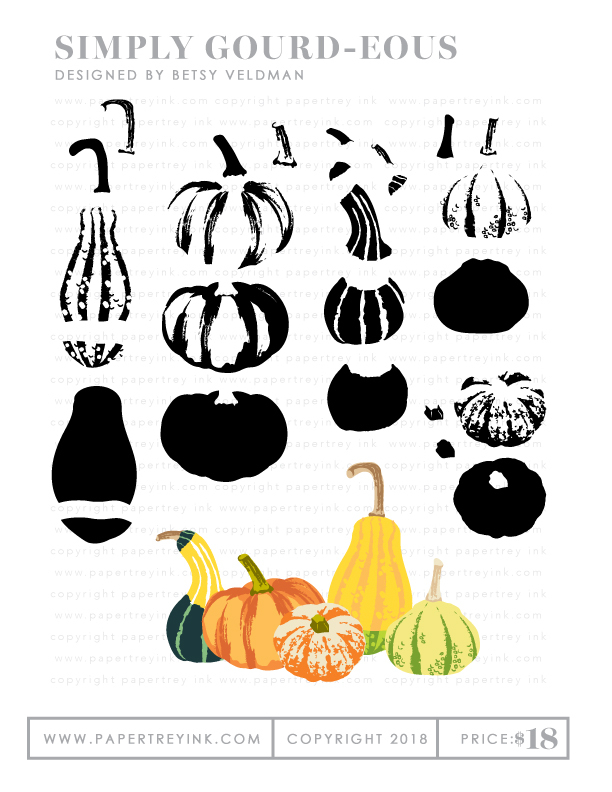 Real gourds and pumpkins are fun to pick from the patch in the fall, and these will be just as fun to stamp on all of your fall projects! The multi-step images come to life when stamped in vivid autumn hues. Generously sized, they’re great for creating focal points. Pair them with your favorite sentiments and use them for autumn birthdays, thanksgiving, or for sharing home-grown gourds and goodies fresh from your own patch! STAMP DETAILS: This set comes on a single 4×8 acetate sheet. The largest pumpkin measures 1-3/4” wide and 1-5/8” high. The smaller striped pumpkin measures 1-1/4” wide and 1” high. The shorter striped squash measures 1-3/8” wide and 1-5/8” high. The gooseneck gourd measures 1-1/4” wide and 1-7/8” high. The taller two-toned striped squash measures 1-1/8” high and 2-5/8” high. 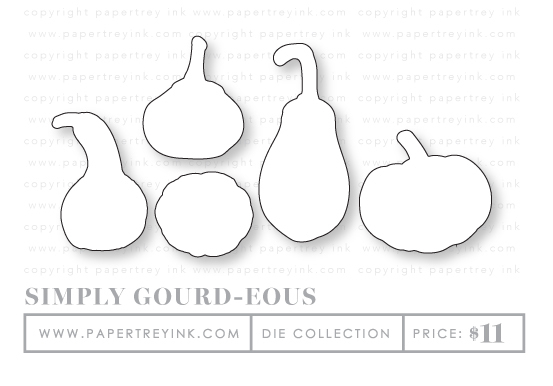 The Simply Gourd-eous dies consists of five individual dies, which are designed to coordinate with the Simply Gourd-eous stamp set.